Heat oven to 350°F. Grease and flour bottom only of 9x5-inch loaf pan. In large bowl with electric mixer, beat brown sugar and butter on medium speed until light and fluffy. With spoon, stir in zucchini, pineapple and eggs. Stir in flour, baking soda, 1 teaspoon cinnamon, the salt and allspice until well blended. Fold in walnuts. Spread evenly in pan. Bake 60 to 70 minutes or until toothpick inserted in center comes out clean. Cool 10 minutes; remove from pan to cooling rack. Cool 30 minutes. In small bowl, mix all glaze ingredients until smooth; spoon over warm loaf. Cool completely, about 1 hour. Store in refrigerator. 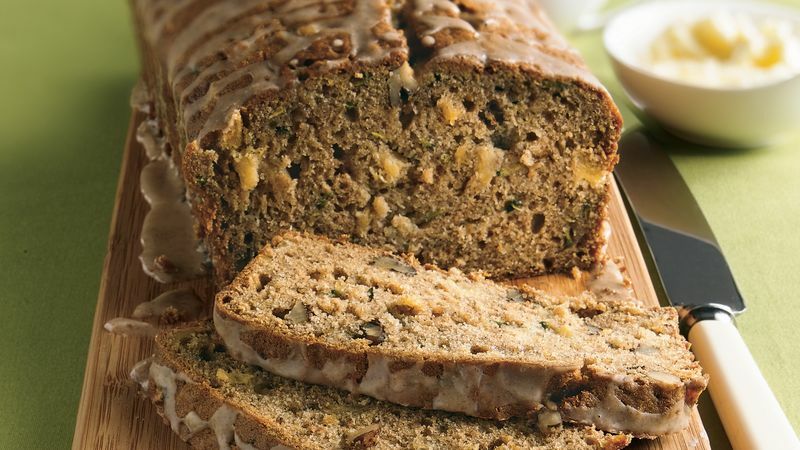 The zucchini in this recipe makes the bread very moist, so it stays fresh for several days.